Our VIP chairs come in two different styles, the Royal and the Platinum. Both chairs add panache and chic to any banquet room. The Royal is our most exclusive product as it is incomparable. It is finished in 22 carat gold. 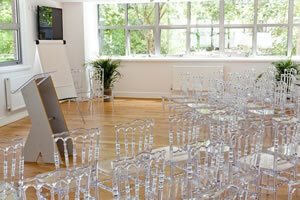 The Platinum chairs add a real touch of class with their mirror like look. Both products can have their seat pads upholstered in our vast array of fabrics to choose from, or you can have your own pads made in your specific fabric of choice. Our Conventional chairs come in two styles, the Ice and the Snow. Both chairs are made from Polycarbonate.The Ice chair is totally clear and the look like an Ice sculpture based on the Napoleon chair design. 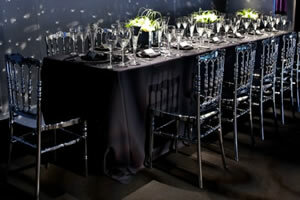 They are widely used in High end venues, rental companies and private venues. The Snow chair is a chair that is often used both indoors and outside for weddings. Being made from Polycarbonate ensures you have a very strong chair that is stackable, wipes clean and will not chip like a conventional wooden chair. Both chairs are 100% recyclable. Please use the drop down menu (above) to see examples of each range.